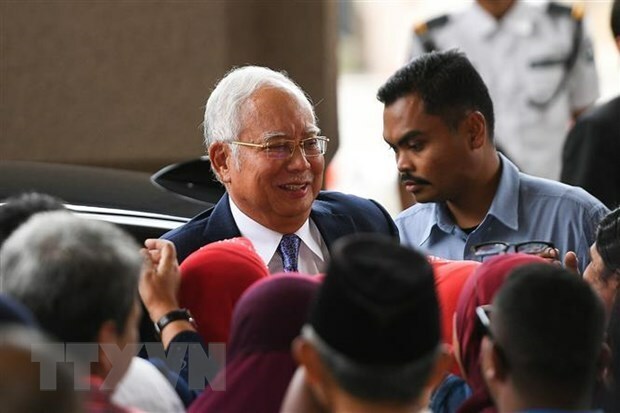 Hanoi (VNA) - Former Malaysian Prime Minister Najib Razak returned to court for the second day of his high-profile corruption trial in Kuala Lumpur on April 15, with the former PM accused of plundering large sums of money from sovereign wealth fund 1MDB. During the first day of trial on April 3, Najib faced seven charges including abuse of power, corruption and money laundering. According to prosecutors, the former PM and his cronies stole billions of US dollars from 1MDB and spent it on everything from high-end real estate to artworks and a luxury yacht. Since the general election 2018 that led to the victory of Prime Minister Mahathir Mohamad, Najib has been charged with 48 counts, mostly involving the 1MDB fund and other State institutions. However, he rejected all convictions regarding 1MDB, saying that they are politically motivated. 1MDB was founded by Nazib in 2009 to promote Malaysia’s socio-economic development via global partnerships and foreign direct investment.